It was undoubtedly the Brandywell club's best performance of the season under Devine as they put St Pat's to the sword in the opening 45 minutes. Goals from Patrick McClean, a sublime free-kick from Gerardo Bruna and Junior Ogedi-Uzokwe's close range strike, all within the opening 30 minutes, put the match out of reach for the Saints who had Kevin Toner sent off for a reckless challenge on Ciaron Harkin. It was the third successive win on the road and completed a successful raid on Dublin with six points from games at Richmond Park and at UCD in the space of 72 hours! "It was two tough trips to Dublin in the space of 72 hours," said a delighted Devine afterwards. "To take six points, the boys deserve tremendous credit. It shows you their mentality, their hunger and desire to do well for our football club. Declan Devine was delighted with his side's display against St Pat's. "It was a brilliant three points. It was a very difficult game. But I thought for 30 minutes in the first half we played as well as I've seen a Derry City team play for a long time in terms of our retention of the ball and our penetration with the ball. We were very good." With the games coming thick and fast and a tough clash against league leaders, Shamrock Rovers coming up on Friday, Devine felt the need to freshen his squad up for the trip to Inchicore. And he felt the performance of those who came back into the team showed how strong his squad is, claiming he's always had faith in those players on the periphery. "The guys who came in were brilliant, Patrick McClean has scored a goal. Gerardo Bruna came in and scored a goal. Josh Kerr has come in for his first start in a few weeks and he never put a foot wrong. "We've always believed in the group and always thought we've got good players here. "We have Aidy Delap, Conor McDermott, Michael McCrudden and Jamie McDonagh all missing as well so we have players here who are chomping at the bit. "I'll continue to say that if we're going to be anything this year we're going to need everyone pulling the one direction. "It's early days to be looking at league tables but I'd rather be where we are than fighting down around the bottom obviously. "But we want to make sure we get as many points as we can. We're fully aware there will be games this year where we won't be as free-flowing. There will be games when we find it difficult but ultimately it's about getting as many points on the board as we possibly can and let'#s see where it takes us." 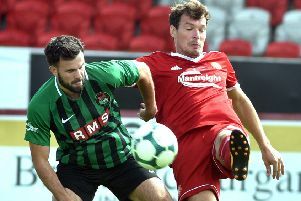 It's first versus second on Friday night as Derry City return to the Ryan McBride Brandywell Stadium and Devine has urged the fans to get behind his team once again as they look to exact revenge following their 2-0 loss in Dublin earlier this season. "Shamrock Rovers have been sensational this year and have clipped our wings already down in Tallaght," added Devine. "It will be nice to see when they come to our patch can we manage the game a bit better. "We're just trying to evolve as a team ourselves and get better every week. If you take six points in Dublin from a 72 hour window it's fantastic. "We'll get ourselves ready for Friday night but it;s a big ask and we'll need all the Derry fans behind us and everybody pulling together as we try to get something from the game."